Makes any skin feel just like a baby's. Great when it is hot out and you want to stay dry. Our powder contains no talc. Comes in a 16oz jar with a puff. As always, special orders are available! 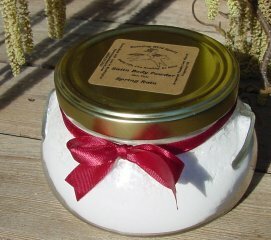 Ingredients: arrow root powder, corn starch, essential oil or fragrance* oil.